By the time they hit issue #122, the editor, writer and artists were rolling along like a Rolls Royce Silver Phantom. The issue contains the introduction of a nifty new villain, the Top, along with the continuing broadening and deepening of the character personalties and lives. The issue opens with Barry being visited by Anton Previn, a friend and fashion designer he met five years earlier in Paris. Thus we now know that Barry is in his early thirties, having just attended his ten year college reunion in the previous issue, and that he spent some time traveling the world, to France at least. Barry introduces Anton to Iris and we’re into a B plot about Anton giving Iris a makeover to surprise Barry. And where is Barry? He’s off chasing Roscoe Dillon AKA the Top whose gimmick is a mastery of tops. Roscoe pick up this arcane knowledge in the prison library much like the Mirror Master did did during his prison stint making me wonder if the library at the prison in Central City was perhaps a little too good. Roscoe starts out as a petty crook, but soon graduates to wanting to become ruler of the world. Seems like a leap, but, anyway, he creates a giant spinning atomic grenade that will blow up half the Earth while putting the Flash in peril by trapping him inside the grenade. 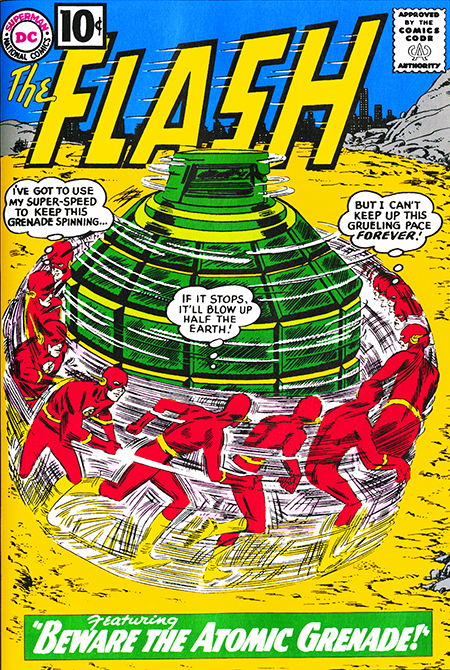 The Flash breaks free, sends the grenade into outer space, and captures the Top on the other side of the world where he went in case his not-a-bluff was called. The B plot is resolved when Barry is so stunned by Iris’s makeover that he’s speechless. Taking Barry’s silence as a “no”, Iris returns to her old self and everything returns to normal. The second story is a Kid Flash story featuring a teen idol named Silver Mask due to the mask her wears while performing. You have to wonder if John Broome was influenced by the fifties rockabilly singer Jerry Lott who performed while wearing a mask as the Phantom. I remember reading that story in the summer of ’61 and thinking how Silver Mask could be spun off into his own book which would be written by me. Hey, Jim Shooter started his comic book writing career at fourteen so it wasn’t that crazy of an idea. At one point in the story, KF runs past some kids playing sandlot football which hit a soft spot for me since I loved playing backyard football, at least until I broke my ankle and dislocated my shoulder. As risky as my comic book writer/artist stratagem was, it was a lot less risky than playing football. The Flash Grams column features the first appearance of Paul Gambaccini who would become a frequent letter writer to Julie Schwartz’s magazines as well as a pop culture writer and a musicologist/DJ in Britain down the road. Next up, the comic book that rocked everything.